Next time you go to buy a pair of jeans or skirt, don't feel happy that you have reduced your waist size if you fit into something less than your actual size. Disguised as a perfect fit, brands are trying to lure your buy based on your appeal to lose weight and slim down. According to Esquire Magazine, many retailers are lying to consumers about waist sizes in order to make them feel thinner and more likely to buy their clothes. The worst offenders? 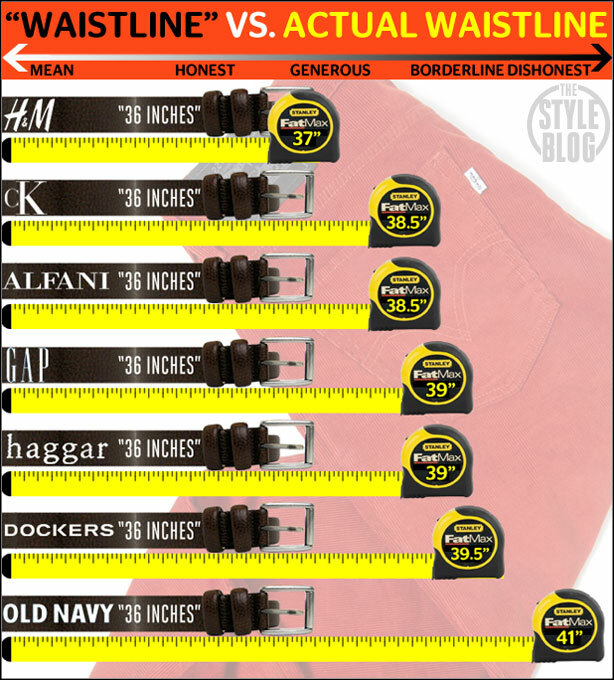 A pair of Old Navy pants labeled as size 36 were in fact 41 inches, a pair of size 36 Dockers were actually 39.5 inches, and Haggar and Gap were both selling 39 inch pants as size 36. CBS Sunday Morning featured a story today about the trend towards "vanity waist sizing."